Babylon is personified as a whore in the tale of the woman and the beast. This episode is included in chapter 17 of the Revelation and constitutes Book 9 of the commentaries by Beatus. The Book is divided into three passages with the respective explanationes and illustrations: the great Whore and the kings of the earth, the woman riding the beast and the Lamb’s triumph over them, in which the woman does not usually appear except very occasionally as in the Osma Beatus. As A. Sepúlveda points out, each miniature illustrates the respective storia, although many details stem from the interpretations given in the explanatio of the others since they are closely linked, even in the apocalyptic text. Babylonia is the city of the devil, the opposite of the city of God, celestial Jerusalem, the Church, which is represented in the Revelation in human form in the image we discussed earlier of another woman depicted enshrouded in the sun with the moon under her feet and wearing a crown of stars above her head (ff. 147v-148r). Unlike the other codices, the Silos Beatus depicts the Great Whore standing rather than enthroned (meretricis magnae sedens super aquas multas). The latter formula is a variation of the iconography of the Abbasid caliphs in majesty, which apparently inspired the miniature. There is no crown above her head, nor any representation of a city, an element which originated in the Hellenistic world and extended into the Classic era. It was adopted from that era by the Sassanian art of the 3rd-7th centuries AD and consequently, with the addition of a half-moon above, became an Islamic canon. In one hand is a cup, the base of which ends in two appendages, held by the whore and one of the kings to whom it is being offered. This type of conical cup is related to the cups in the Abbasid worlds. The one depicted in the Silos Beatus is particularly interesting because of its lavish, violet crystal mounted upon an eye-catching gold base. This emphasis is in fact in line with the text of the following storia which states “…in her hand, a cup of gold”. As the explanatio mentions, it had appeared previously in the prologue to Book 2. The whore has drunk the wine of fornication with the kings of the earth, as mentioned in the text: ubi mulier pro/pinat de calice pleno / sanguine. The woman is positioned over the great expanse of water drawn upon a violet mass riddled with lines in red and blue tones. The flow of water has a symbolic meaning and depicts the Euphrates river flowing across Babylon, the very city identified in the apocalyptic tale with the great whore. The reference to the waters contradicts the opening words of verse 3 (and transported me in spirit to the desert), which it would be more logical to associate with the following vision depicting the Whore upon the beast. The two kings wear a cloak over an ankle-length tunic, and graceful, artistic crowns – a convention used by the illuminator for this type of item and lamps too. The illustration is followed by the text of the explanatio featuring an E[t uenit unus ex septem angelis...] consisting of the small head of a lion, from which emerge the typical developed foliate motifs with a palm leaf between them – all yellow and riddled with tiny red lines. 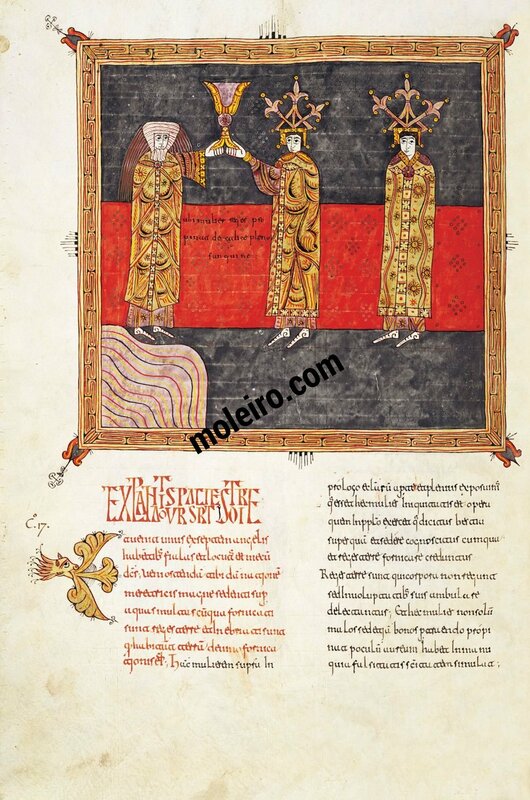 "M. Moleiro is the most prestigious company in the world specialised in the reproduction of codices, maps and works of art usually made on parchment, vellum, paper, papyrus ... between the 8th and 16th centuries in the form, in most instances, of illuminated books. The techniques employed in reproducing the codices, combined with the wisdom and skilled craftsmanship of our trade, enable us to remain very faithful to the original. Bound in leather tanned used the methods of years past and reproduced on special, hand-made paper, our codices reproduce all the nuances of the paintings, parchment, gold and silver leaf etc. A M. Moleiro codex is, therefore, more than a facsimile book, it is an exact replca, a 'First, unique and unrepeatable edition'. "